For the past several years, we’ve watched Boone, NC eclectic rock outfit Rainbow Kitten Surprise balloon from a buzzy indie fixture to a nationally lauded, major label backed, must-know band, frequently stopping through Music City on their ascent, each time with impressive new tunes in tow. After stopping through last spring to play Cannery Ballroom, not long after their stellar Elektra debut How To: Friend, Love, Freefall, then returning in the summer to rock Live on the Green, we’re thrilled to RKS back again so soon, this time for an impressive and well-earned two-night stand at The Ryman Auditorium, Feb. 24 & 25 with fellow folk-tinged up and comers Mt. Joy, a testament to just how huge they’ve become. Night one is already sold out, so if you’ve been slacking, we’d urge you to snag tickets to night two ASAP right here! However, we’re thrilled to announce that we’re also giving away a pair of tickets to the Feb. 25 show to one lucky fan; read on for more about the lineup, and enter below. Formed during their freshman year of attending Appalachian State in Boone, NC (and largely all hailing from the North Carolina area), Rainbow Kitten Surprise‘s early days were marked by singer Sam Melo and guitarist Darrick “Bozzy” Keller playing open mics and coffee shops around campus, and penning early acoustic tunes, before recruiting friends from their hall to round out the lineup into a proper band- guitarist Ethan Goodpaster, bassist Charlie Holt, and drummer Jess Haney. Named by a friend they were visiting in the hospital, loopy on meds, the group’s colorful name and eclectic sound helped them earn a quick early fallowing at App State, throughout the region, and beyond, with early independent efforts and backing from their school’s label giving way to cult critical praise for their first full-length, Seven + Mary (technically a repackaging of their first two EPs). By 2015’s RKS, the band were becoming a national fixture, touring regularly and packing clubs (including frequent early stops in Nashville), giving way to appearances at major festivals like Bonnaroo, Firefly, Sasquatch, and Austin City Limits. 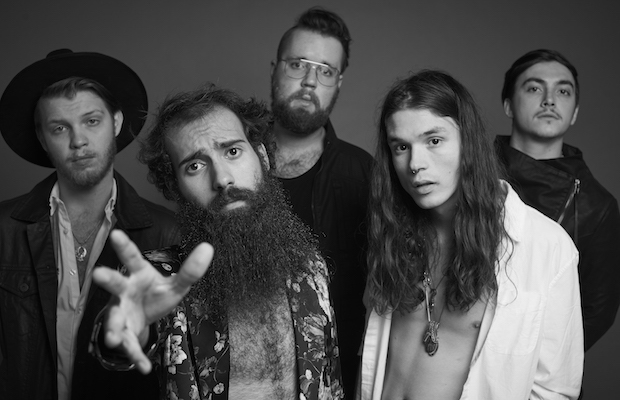 With their poetic, personal, and story-driven writing style, and expansive sonic reach, which pulls from elements of folk, indie rock, pop, and even hip hop, RKS nabbed a major label deal with Elektra in 2017, and dropping their Jay Joyce helmed, Nashville recorded LP How To: Friend, Love, Freefall last year; undeniably the band’s best, biggest, and most focused album to date. Now a celebrated and certifiably huge breakout act, Rainbow Kitten Surprise remain one of the most compelling and essential live artists around, and though thoroughly impressive and well-deserved, their two-night stand at The Ryman feels like a long-time coming. Don’t miss it! While they only formally came together as Mt. Joy three years ago, bandleaders Sam Cooper and Matt Quinn’s musical collaborations can be traced back more than decade, when the pair met in high school, in their native Philadelphia, and made music together until college took them down separate paths, continuing to collaborate, but unsure that music would ever become a serious career path. After they both wound up in Los Angeles several years later for work, they began collaborating more seriously once more, recording some songs in early 2016 and choosing the moniker Mt. Joy, after a real mountain near where they grew up, before being split again by circumstance, as Cooper returned to Philly for a job, and Quinn enrolled in law school in LA. The unexpected success of their first single, “Astrovan,” forced the duo to reconsider, and they put career and school projects on hold to make Mt. Joy their full-time focus, recruiting Michael Byrnes, Sotiris Eliopoulos, and Jackie Miclau to complete their lineup. After a string of buzzy singles and live dates, the group dropped their eponymous debut LP early last year, honing their folky, indie, and timeless sound a la Bob Dylan or Alabama Shakes, and becoming a must-know rising act in the process. Winner will be announced Tuesday, Feb. 19 at 12 p.m. CST, and will receive one pair of tickets to the Monday, Feb. 25 date only. Tickets cannot be redeemed or swapped for a different show. Good luck! Win Tix to Rainbow Kitten Surprise 2/25 at The Ryman! Rainbow Kitten Surprise and Mt. Joy will perform Sunday, Feb. 24 and Monday, Feb. 25 at The Ryman Auditorium. The shows are all ages, begin at 7:30 p.m., and tickets for 2/24 are sold out, while 2/25 are available to purchase for $32.50.